Meditating at Afrika Town during Liberation Day (via Facebook). 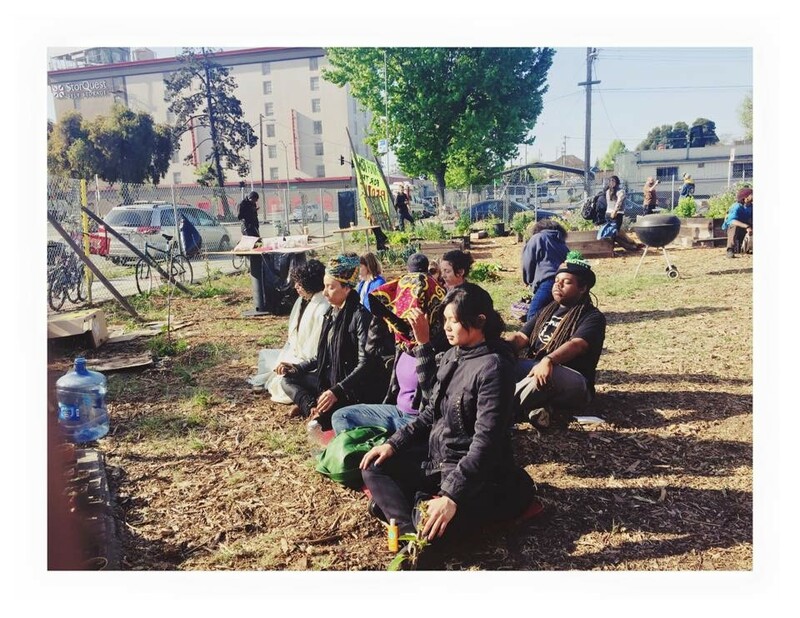 “Afrika Town is at ease.” That tweet, posted on Friday afternoon, amounted to a declaration of victory by supporters of West Oakland’s Afrika Town Community Garden, who began the day they’d dubbed Liberation Day expecting to face down a fleet of bulldozers — a standoff that activists characterized as a battle against gentrification. Instead, it appears that Noel Yi, the property owner who planned to sell the plot of land to luxury condo developers, has backed down and agreed not to forcibly remove the garden for now. Still, Afrika Town’s long-term survival isn’t a foregone conclusion: The lot currently is currently listed for sale for $995,000. Daunting as that seems, the garden’s organizers say their next step is to raise the money they need to purchase the lot. Afrika Town volunteers also pled their case to District 3 Councilmember Lynette McElhaney, who eventually reached out to Yi’s representative, real estate agent Gary Robinson, in an effort to de-escalate the situation. She, too, encouraged Robinson to ask Yi not to involve the police. Apparently, those arguments were enough to convince the property owner to back down for now. And Robinson, who delivered the good news in person on Friday, now says he’s even hoping he can convince Yi to sell the lot to the Afrika Town organizers for a discounted price. “If they can show that they have the means to buy it, I can talk to the seller to make sure they have time,” Robinson said.